For more information about Prestigious External Scholarships and Awards, you may contact Dr. Gary Sloan at 205-348-8444 or email Dr. Sloan, or contact the faculty representative listed with each scholarship or award. Please note, deadlines for scholarships and awards may vary slightly from year to year; be sure to check the scholarship/award’s website or with the appropriate faculty contact for the actual dates. Support to live and work in Russia for intensive language training and to gain professional experience that will benefit U.S.-Russian relations. Fellowships and grants for graduate study in Denmark, Finland, Iceland, Norway, and Sweden. Support to live and work in Germany to gain professional experience that will benefit U.S.-German relations. Boren Scholarships, an initiative of the National Security Education Program, provide unique funding opportunities for U.S. undergraduate students to study less commonly taught languages in world regions critical to U.S. interests and underrepresented in study abroad, including Africa, Asia, Central and Eastern Europe, Eurasia, Latin America, and the Middle East. Boren Scholarships promote long term linguistic and cultural immersion, and therefore study abroad proposals for two or more semesters are strongly encouraged. Preference will be given to undergraduate applicants proposing at least six months overseas. Boren-funded programs can begin no earlier than June 1 of the application year. Summer-only programs must be 8 weeks or more and are limited to science, technology, engineering and mathematics (STEM) students. For more information, contact campus representative Dr. Carmen Mayer, ckmayer@ua.edu. Support graduating seniors to work for one year as research assistants for Carnegie Endowment senior associates. Support summer study of one of 14 critical needs foreign languages (Arabic, Azerbaijani, Bengali, Chinese, Hindi, Indonesian, Japanese, Korean, Persian, Portuguese, Punjabi, Russian, Turkish, and Urdu). Contact Dr. Tayler Kent for more information about this scholarships at (205) 348-9303 or tmkent@ua.edu. The German Academic Exchange Service (DAAD) supports a wide variety of scholarships, fellowships, and grants for undergraduate students, graduate students, and professionals to study or work in Germany. Support for three years for up to $20,000 per year for study toward the doctoral degree in eligible fields of study. Eligibility requirements include 1) Open to all citizens or nationals of the United States, regardless of race, national origin, religion, gender, age, disability, or sexual orientation. However, belonging to one of the following ethnic groups will be counted as a positive factor in the evaluation of the applicants: Alaska Natives (Eskimo or Aleut); African Americans; Mexican Americans/Chicanas/Chicanos; Native American Indians; Native Pacific Islanders (Polynesian/Micronesian); Puerto Ricans. 2) Applicants must provide evidence of superior academic achievement. 3) Targeted toward individuals committed to a career in teaching and research at the college or university level. 4) Only individuals who are enrolled in or planning to enroll in an eligible research-based program leading to a Ph.D. or Sc.D. degree at a U.S. educational institution who have not earned a doctoral degree at any time, in any field, are eligible to apply. Include comprehensive (full) grants, which support research in a foreign country or teaching grants to teach English language classes in a limited number of foreign countries. Provide round-trip transportation, tuition, book and research allowances, supplemental health and accident insurance, and living expenses for an academic year based on living costs in the host country. Language or orientation courses are provided, as needed. Proposals may include university coursework, classes in music or art schools, independent research, teaching, or a combination of these. Number of Awards: Up to 1,200 awards are made each year for study in over 140 countries. The number of awards available for each country varies. Awards include comprehensive (full) grants, which support research in a foreign country; travel grants (only to Germany, Hungary, or Italy) to supplement other awards or a student’s own funds for study in one of these countries; or teaching grants to teach English language classes in a limited number of foreign countries. Preliminary applications are due on-campus early in September; final applications are due mid- October. Award: All tuition and fees, a maintenance allowance for living expenses, plus travel expenses for one to four years of study at Cambridge (a second Bachelor’s degree, a one-year graduate program, a two-year graduate program, or the Ph.D. degree, in which the scholarship may be renewed for up to four years). The annual value of the scholarship is currently in excess of $30,000. Number of Awards: Approximately 100 each year. Eligibility: Must be a graduate of an accredited university with an excellent academic record before beginning study and be admitted to Cambridge for graduate study. There is no age limit. Selection Criteria: Scholarships are awarded based on the person’s intellectual ability, leadership capacity, and the desire to use their talents and knowledge to contribute to society throughout the world to improve the lives of others. Deadline: Applications are due around mid October. Support for undergraduates who are already receiving financial support through a Pell Grant to study abroad. Stipends up to $5,000 are available to cover the cost of tuition, room and board, books, insurance, and transportation. For more information, contact the Education Abroad office, 135 BB Comer or studyabroad@ua.edu. Award: Up to $7,500 per year, based on need, for up to two years for undergraduate students majoring in the natural sciences, mathematics, or engineering. Eligibility: Must be a U.S. citizen or resident alien who is a full-time sophomore or junior in an accredited college or university and in the upper fourth of his/her class. Nominees for Goldwater Scholarships must express an interest in pursuing a graduate degree and a career in the natural sciences, mathematics, or engineering. Students who plan to study medicine are eligible only if they plan a career in research rather than one in private practice. Selection Criteria: Nominees are evaluated based on their academic performance and on a demonstrated commitment to and potential for a career in the natural sciences, mathematics, or engineering. Strong candidates will already have extensive research experience prior to applying for an award. Nomination/Application Procedure: Applicants must be nominated by their college or university. Only four students can be nominated each year. Deadlines: Preliminary applications to select the four nominees from the University are typically due on campus in early November. Final applications for the four nominees must be submitted to the Goldwater Foundation by the Faculty Representative by around the end of January. Fellowships to support up to five years of graduate work at a number of prestigious universities toward the Ph.D. in applications of the physical sciences (e.g., astronomy; applied math; some areas of biology, including biotechnology; chemistry; earth sciences; engineering; physics). A stipend of $10,000 is awarded to one to three graduating seniors to support a one-year public service project. Support for graduate work in the arts, humanities, and social sciences. Awards: Fellowships are awarded to students who are about to complete, or have completed, their undergraduate course of study and plan to begin graduate work on a full time basis. Junior Fellows have two years to complete their degree. Senior Fellowships are awarded to teachers who wish to undertake work for a graduate degree on a part-time basis through summer and evening classes. Senior Fellows have up to five years to complete their degree. The maximum amount of each award is $24,000, prorated over the individual period of study. Fellowship payments cover the actual costs of tuition, required fees, books, and room and board, but cannot exceed $12,000 per academic year. Normally, Fellows receive less than these maximum amounts. Number of Awards: At least one award is made for each state each year. Eligibility: Applicants must 1) be a U.S. citizen of U.S. national, 2) be a teacher, or plan to become a teacher, of American history, American government, or social studies at the secondary level, 3) possess a bachelor’s degree or plan to receive a bachelor’s degree no later than August 31 of the year in which they are applying 4) wait at least 4 years from the time that any previous graduate degree was awarded before applying for a James Madison Fellowship, and 5) after earning a Master’s degree, each James Madison Fellow must teach American history, American government, or social studies in grades 7-12 for no less than one year for each full year of academic study under the fellowship. Fellows are required to attend a four week summer workshop at Georgetown University. Selection Criteria: Applicants are evaluated based on 1) their demonstrated commitment to a career teaching American history, American government, or social studies at the secondary school level, 2) demonstrated intent to pursue and complete a program of graduate study that emphasizes the Constitution and offers instruction in that subject, 3) demonstrated devotion to civic responsibility, 4) demonstrated capacity for study and performance as a classroom teacher, and 5) their proposed courses of graduate study. Nomination/Application Procedure: No nomination by the University is necessary. Applicants turn in an application form, two or three letters of evaluation, and a 600-word essay on why study of the Constitution is an important part of a secondary school education. Deadline: Applications must be received no later than March 1. Award: One or two years of support for study at any British university for a graduate degree, with the possibility of extensions for those pursuing the Ph.D. Includes living expenses, tuition, books, travel to and from the U.S., and travel in connection with studies. The average award is £20,000 per year. Number of Awards: At least 40 are awarded each year. Eligibility: Applicants must be U.S. citizens, hold a first degree from an accredited four-year college or university in the U.S., have a GPA of at least 3.7, and be endorsed by the applicant’s educational institution. Selection Criteria: Successful applicants are selected based on their intellect and character, as evidenced by their scholastic attainments and by other activities and achievements. Other criteria utilized include the potential to make a significant contribution to society; motivation; seriousness of purpose; and, in particular, the presentation of a specific and realistic program proposal. Nomination/application process: Applicants must be nominated by their college or university. Deadlines: Application materials are due on campus early in September, followed by on-campus interviews soon after that. Completed materials must be received by the Regional Center early in October. UA students who are from Alabama apply through the Regional Center in Atlanta, GA., which includes applicants from Alabama, Georgia, Florida, Mississippi, North Carolina, South Carolina, and Tennessee. UA students from other states can apply through the Atlanta Region or through their home region. Scholarship recipients will be selected by the Regional Committees after interviews that will take place in early November. Support for one year of graduate study in any discipline at any university in Ireland or Northern Ireland. Support for one to four years for undergraduate students from disadvantaged backgrounds who are committed to careers in biomedical, behavioral, and social science health-related research. Support for full-time study during the junior and senior years and a paid summer internship for students in the life and physical sciences, mathematics, engineering, computer and informational sciences, social and behavioral sciences, and teacher education in order to prepare students for careers with the National Oceanic and Atmospheric Administration or other federal, state, or local levels of government involved in natural resources or science. Provide one to six semesters of support for graduate study of foreign languages and cultures deemed critical to U.S. National Security. Contact Dr. Carmen Mayer for information on these fellowships at (205) 348-9303 or cmayerro@ua.edu. Provide one to two semesters of support for undergraduate study of foreign languages and cultures deemed critical to U.S. national security. Contact Dr. Carmen Mayer for more information about this scholarships at (205) 348-9303 or cmayerro@ua.edu. Support for three years of graduate study in research-based master’s or doctoral programs in science, math, and engineering. Support for tuition, room, board, and mandatory fees during the junior and senior years of college or the first and second year of graduate study in areas such as political science, public policy, international affairs, public administration, business, economics, foreign languages, or sociology. Award: Two years of support, with the possibility of a third year, for study at The University of Oxford for a second bachelor’s degree or a graduate degree. Includes all tuition and fees plus a maintenance stipend for living expenses and paid traveling expenses to and from Oxford. Additional funds for research or study-related travel may also be available. Number of Awards: Thirty-two scholarships are assigned annually to the U.S. Eligibility: Must be a U.S. citizen, preferably unmarried, and at least 18 but not yet 24 years of age, and be able to complete a bachelor’s degree prior to beginning tenure as a Rhodes Scholar. Selection Criteria: Applicants should demonstrate intellectual and academic achievement of a high standard and show integrity of character, an interest in and respect for their fellow beings, the ability to lead and the energy to use their talents to the full. The latter quality typically is demonstrated by participation and success in sports. Deadlines: Application materials are due on campus early in September followed by on-campus interviews soon after that. Completed applications must be received by the District Selection Committee early in October. 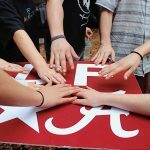 UA students who are from Alabama will apply through District 7, which includes applicants from Alabama, Florida, Louisiana, and Mississippi. UA students from other states can apply through District 7 or through their home district. Scholarship recipients will be selected by the District Committees after interviews that will take place in early to mid November. Support for up to two years of graduate study for New Americans (immigrants or children of immigrants). Awards: $30,000 annually for 2-3 years of graduate study. Number of Awards: About 55-65 awards are made each year. Eligibility: Candidates must 1) be a U.S. citizen or U.S. national; 2) be in the upper quarter of their junior class; and 3) have outstanding leadership potential and communication skills. Candidates normally apply during their junior year. Selection Criteria: Successful candidates will have extensive records of public and community service, be committed to careers in government or elsewhere in public service (includes employment in government at any level, uniformed service, public-interest organizations, nongovernmental research and/or educational organizations, public and private schools, and public service nonprofit organizations) and have outstanding leadership potential and communication skills. In 2005 a new service requirement was added to these awards. Truman Scholars are now required to work for three years (within the first seven years following graduation) in public service. If they fail to meet this requirement, the award must be repaid plus interest. Nomination/Application Procedure: Applicants must be nominated by the Faculty Representative to the Truman Foundation. Deadlines: Draft applications are due to Dr. Halli in early November; on-campus interviews will be conducted in early January and up to four UA nominees will be selected. Final applications are due in Washington, D.C. near the end of January or the first of February. Finalists will be interviewed by the Foundation in late February through March. 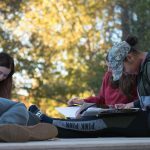 Awards: Undergraduate Scholarships: These awards, for up to $5,000, are given to college sophomores and juniors who have demonstrated outstanding potential and a commitment to preserving, protecting, or restoring environmental resources. Fellowships: Ph.D. dissertation fellowships of $24,000 are given to students whose work is in the areas of environmental public policy or environmental conflict resolution. Recipients must be in the final writing year of their Ph.D. work and must submit a copy of their dissertation to the Udall Foundation at the end of the award year. Eligibility- Undergraduate Scholarships: Must be a U.S. citizen, permanent resident, or U.S. national; must be a currently enrolled sophomore or junior; must have a minimum 3.0 GPA and be in the top quarter of the class. Dissertation Fellowships: must be a U.S. citizen or U.S. national. The Foundation requires that the dissertation topic have significant relevance to national environmental public policy and/or environmental conflict resolution. The fellowship must be used for the final year of writing the dissertation. Applicants must have completed all coursework, passed all preliminary exams, and had the dissertation research proposal or plan approved prior to submitting the application. Selection Criteria: UG Scholarships-Applicants should have 1) an extensive record of campus and community service directed toward environmental issues and causes or to tribal policy or health care; 2) demonstrated commitment to and career goals consistent with improving, preserving, protecting, or restoring our environmental resources, or to tribal public policy or health care; 3) knowledge and understanding of Morris K. Udall’s legacy of public service, particularly as it relates to career goals; and 4) demonstrated leadership, character, integrity, and well-roundedness. Dissertation Fellowships: Applications are reviewed by distinguished scholars in the field for quality, originality, significance, and the feasibility of completing the entire dissertation within a one-year period. Nomination/Application Procedure: Applicants must be nominated by the Faculty Representative to the Udall Foundation. Deadlines: All undergraduate scholarship application materials must be turned in around the first of March. All dissertation materials must be turned in around the first of February.